Barcelona - L’illa Diagonal (Rafael Moneo, 1993, Avinguda Diagonal, 579-585), 2016. Wikicommons/ Zarateman. 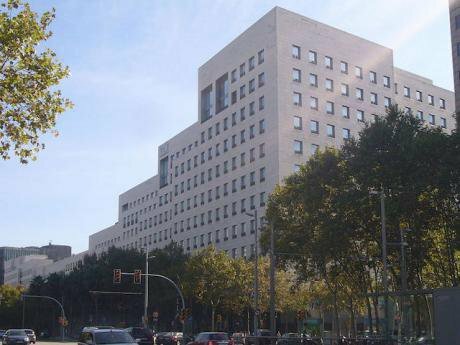 Some rights reserved.Barcelona has become the focus of international attention due to a proposal for urban transformation in its Eixample district, through the creation of “supermanzanas” (superblocks). Combining nine of the blocks proposed by Ildefons Cerdà in the 1859 plan (very different from those realised) is meant to reduce traffic in the streets and squares inside the superblock’s perimeter, confining it to the perimetral streets, in order to solve serious problems deriving from pollution, the near absence of green areas, and the minimal space for pedestrians caused by the omnipresence of cars. The “supermanzanas” (superblocks, literally ‘superapples’) project aims at creating four squares in every superblock, converting the inner part of intersections in areas mostly dedicated to pedestrians. This is a proposal that, if completely fulfilled, will radically change the face of the city. The central issue is the following: is this a change that is going to confirm features of the neo-liberal city, limited to mitigating them with the introduction of – essential and very helpful – measures for the reduction of air and accoustic pollution and for the creation of pedestrian areas? Or is this an opportunity to fundamentally challenge the neo-liberal economy in its urbanism, its processes of production, its voracity, its unfamiliarity with ethics, its inequality and its destruction of the environment? International attention towards the project has been accompanied by recent, and predictable, anger on the part of the residents of the site of the first superblock in Poble Nou, due to the concentration of traffic. This has remained unchanged in its quantity and quality because of the habits of car–users travelling around the city on the perimetral streets, due also to the absence of areas dedicated to the sacred rite of parking. These criticisms should oblige us to slow down and reflect. Here we are not going to analyse technical issues, the flows of cars, directions, signalling, number of parking areas. 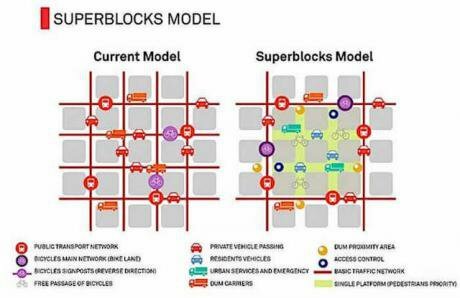 On the contrary, we want firstly to focus on the resistance and criticism of the superblocks made by the inhabitants, only then going on to analyse the elements that could turn the “supermanzanas” into a feature for significant change. The opposition towards the project can be explained by two elements. The first one, with deep roots, is the cultural educational problem: perhaps the blind rage caused by the offence to the sacred nature of the car reveals an underlying problem in a (mis)education system, whose main prerogative is teaching people to accept the status quo in neo-liberal society without acknowledging or interrogating its foundational premises, thereby silencing any quest for different horizons? The still sacred element of our times – the automobile – despite its obviously destructive impact on city life, is the main issue. This strange God continues to be venerated by the majority of people. Nevertheless, like every God, the automobile limits freedom – even more than the city does – it increases air pollution, threatens our peace with its hypnotic noise, threatens our lives with accidents and with its support to the oil industry, to the pharmaceutical industry, to psychological disorders, to insurance companies, to loans from banking institutions, among other things. It constrains freedom: as has been known for decades – or as it should be compulsory education to teach – the real speed of an automobile is 6 kilometres per hour. The typical American devotes more than 1600 hours per year to its automobile: sitting in it, in motion or stationary, working for paying it, for paying fuel, tyres, tolls, insurance, infringements and duties for federal highways and communal parking. They devote four hours per day in which they use it, look after or work for it […] But if we ask ourselves how these 1600 hours contribute to its circulation, the situation changes. These 1600 hours serve up to make a 10 000 kilometres ride, that is to say 6 kilometres in one hour. It is the same distance that people that live in countries without transport industry can reach. But, while North Americans dedicate to circulation one quarter of their available social time, in non-motorised societies time allocated for that purpose is between 3 and 8 percent of the social time. What distinguishes the circulation in a rich country and in a poor country is not a greater efficiency, but the obligation to consume in high dose energies related to the transport industry. 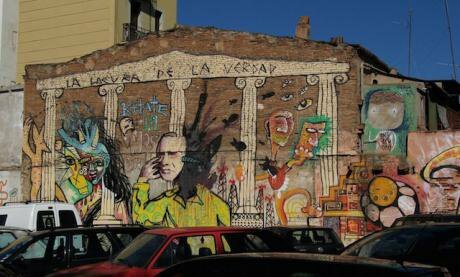 Mural in Poble Nou / Photo by Isabel Rosero (Flickr.) Some rights reserved.The substitution in cities of the automobile with the bicycle has been an urgent need for decades. The high energy efficiency of a bicycle, its inbuilt critique of the neo-liberal economy, its independence from fossil fuel – i.e. wars and environmental devastation – and from everything related to the automotive industry, are fundamental motivations boosting a radical change in approach to the problems of our times. The issue of the veneration of the automobile could be solved with real educational action opposing the mass-media onslaught in support of the automotive industry, insurance companies, etc., who finance newspapers through advertising and content sponsored by brands. The substitution in cities of the automobile with the bicycle has been an urgent need for decades. An educational campaign carried out in streets, in parks, courts, social centres, truly independent and critical newspapers could help us to understand many problems of our society, albeit this is a process that requires time and effort. But the disputed “supermanzana” could represent the beginning of the end of automobiles in the city, if it becomes the catalyst of profound cultural change. The second element of the protests that we want to highlight is the inadequate sense of ‘taking ownership’of the project by the people who live in that area, due to the low levels of participation throughout its genesis and realisation. In order to feel comfortable in a place – public or private – it is necessary for this to be created, modified, lived, penetrated. The feeling of being subjected to the imposition of a project, or insufficient participation in its creation and fulfilment, will always create direct or indirect opposition. Although there have been moments of conversation with the inhabitants of the neighbourhood, apparently these have not been sufficient, in quantity or in quality. In order to convert “supermanzanas” into an instrument for a deep change, disrupting the structure of the neo-liberal city where people are schooled and submissive towards those in power, and in order to contribute to the establishment of a city that is human, cooperative, supportive, equal and respectful towards the delicate natural equilibrium, we have to take into account a very important element: urban agriculture. We are not talking about organising urban gardens to enhance the image of the city, which would immediately become a sustainable model for other cities; we are not talking about gardens so that “elderly people” – considered to be a problem when it comes to production, instead of being respected and considered repositories of wisdom and memory – keep themselves busy after a life of subordinate employment. We are even less talking of creating a new empty and commodified fashion to feed the neo-liberal economy which consumes everything. We are saying exactly the opposite. Urban agriculture can catalyse a slow and deep transformation of the city overall, in different facets, from food sovereignty and environmental protection to the economy, from a proper education to the retrieval of personal autonomy and mutual peer support, on one condition: that this would be proposed, organised, lived, and actively shared among the people who live the city. The lack of green areas in the Eixample district is serious and requires urgent and energetic action. Barcelona has 1076 hectares of parks and public gardens (without counting the Collserola), which means an average of 6,64 m² of green areas per inhabitant, much less than what other cities can offer. Prague, for example, has 2650 hectares of urban parks – without counting natural parks and woods – meaning an average of 21.34 m² per inhabitant). In the Eixample district numbers are noticeably lower: 1.85 m² per inhabitant, due to – among other factors – the distortion and denaturalisation, in its most literal sense, of the Plan Cerdà during its implementation. To be sure, speculation was the main cause. The lack of green areas in the Eixample district is serious and requires urgent and energetic action so that people can live in a fair and healthy way. In a city like Barcelona, in which – despite the many and laudable initiatives adopted by the city council to address the problems of the city – the number of people living in serious difficulty is high, the growing of food in the city would, on the one hand, carry a high symbolic value and be an opportunity to overcome the passive acceptance of a devastating system; on the other hand, it would bring about an incredible number of positive effects in the short term and represent an impulse for change in the longterm. – It would offer free food to people – in the program of Barcelona en Comú the intention of “ensuring the right to basic nutrition” is specified. – It would make the quality of air and microclimate better. The presence of thousands of fruit-bearing trees would clear the air – reducing the levels of ozone, nitrogen dioxide, sulphur dioxide, particular matter PM10 – and would bring important benefits for health, attenuating noise, providing areas of shade, enriching wildlife in the urban perimeter, and reducing levels of carbon dioxide, thereby contributing to the fight against climate change and naturally regulating temperature on the microclimate level, additionally bringing beauty to each season. – It would enhance personal relationships through nature, its understanding, the culture of biodiversity as opposed to the logic of monoculture imposed by corporations and to the conquest and devastation of nature for profit-making. – Together with the substitution of the car by the bicycle and the commitment to degrowth, urban agriculture would contribute to easing the energy problem, by reducing the consumption of fossil fuels in transporting food between regions and countries – or even continents – as well as diminishing traffic in the city due to the transportation of food. – It would boost vegetarian and vegan philosophies beyond fashion and commodification to reflect on the relationships between human beings and animals and the defence of the rights of the latter – who are not machines in the service of humanity, despite what Descartes thought; to reflect also on ethical and environmental problems, contributing to the fight against climate change – since the production of meat and milk is one of the main causes of global warming and of the processes of destruction of rainforests for the production of animal feed. It is necessary to accord the city its educational role. – It would contribute to boosting education in and through the city, outside schools, transforming the city into a learning place. The observation of the process of food growing, from seed – defending biodiversity, using traditional patent-free local seeds, recovering traditional wisdom on harvesting, would reverse the strange idea of food as a good coming from a conveyor, packed by unknown distant hands (often) with no rights, in a plastic bag with a barcode, sold by some speculator who harvests the fruits of the work for some other person. The city programme “Huertos escolares” (‘School gardens’), no doubt useful and positive, would be no longer necessary as it would have become part of the city life, without recourse to school. It is necessary to accord the city its own educational role. The organisation of spaces for urban agriculture in the Eixample district would be a catalyst for the de-schooling of the city, for the collapse of a whole system of values that the so-called compulsory education teaches – dressed up as freedom of choice – through the acceptance of neo-liberal society as it is. – It would spread organic cultivation methods, the knowledge of the ecosystem, the understanding of delicate natural balances, a new sensitivity towards life, nowadays unknown. – It would contribute to bringing the city closer to real democracy, nowadays inexistent. The city council would have only the role of presenting, through an honest, deep and detailed briefing the problems, not only on the urban level, but also on a larger scale, to discuss, propose and coordinate the actions of people in a real participatory democracy. The role of urbanism is to contribute to breaking the ties between the city and the markets. In the context of the weakening democracy that we have been experiencing over recent decades we are de facto living in an oligarchy – the role of urbanism is to contribute to breaking the ties between the city and the markets and to act in order to destabilise the current oppressive system towards the weakest by offering individual and collective tools to realise a participatory democracy, without excluding anyone. The only work that the city council would need to put in place, with a high symbolic value, would be to draw a circle in the middle of each crossroad in the Eixample district and remove the asphalt layer. Before an empty space, in the middle of each crossroad, a place in which market and power are not present, a space that nobody can sell, buy, exploit, rent or use for parking, around this space we should think how to organise the city all together, without exclusion. This would mean taking away the asphalt layer that for decades kept us apart from the land, waterproofing the entire city, waterproofing our sensitivity, and putting at the centre a source of public free quality water, a common good outside of the market, and around the source to grow vegetables and fruits for those who need them, apples that feed indiscriminately. The apple is here, hanging on a tree, a possibility to change into a new era. An apple that is a fruit of the social economy, with no barcode, each apple with a different taste. The apple, fruit of the land, redeemer of the metropolis, feeds people regardless of their passports and bank accounts. This would be a starting point for overcoming the commodification of life and retrieving a relationship with these natural elements in the urban context of the XXI century. Food and beauty for everyone, with no mediation, undertaking a substantial, slow and deepseated change. Vista de l'Illa Diagonal. Jordiferrer/Wikicommons. Some rights reserved.In the symbolic space where power cannot enter, in the website of the city, one can read that the urban gardens of the city are organised by the city council in collaboration with the Fundació La Caixa, a foundation managed by one of the best-known Spanish banks. Having seen the collusion between banks and political powers, it is necessary to terminate forthwith any relationship between the city and the banks. 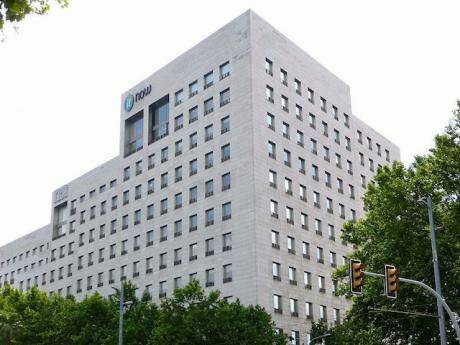 While the “cooperation with the La Caixa Foundation” is in progress, whatever change is made will automatically convert itself into a simulacrum that cannot really impact on the organisation of the city. But in this space for democratic life, the act of taking away the asphalt and presenting soil and water as a common good represents quite another possibility for a radically different city, endowing it both with symbolic meaning and a crucial practical effect. Introducing urban agriculture and putting at its centre water as a common good means considering the past as a tool to change the present. Far from being a step backwards – as if history was a linear process and what comes after is unquestionably called progress – introducing urban agriculture and putting at its centre water as a common good, means considering the past as a tool to change the present. From the errors and horrors of the vast majority of urban planning in the XXth century that forgot life, we should quickly learn how to change the fundamentals of the way to live the city, facing economic, feeding, climate, social, environmental, cultural, aesthetic problems in the context of participatory democracy among peers based on social and environmental justice, non-commodified health, food production outside corporations, commons, popular culture, memory, independent thinking, and education as a libertarian process of liberation. The shopping mall Illa Diagonal, designed by Rafael Moneo and Manuel de Solà-Morales in 1993, is located in the Eixample district. The first stone that was placed – as it is said on the website of the mall – contains an insurance policy and a certificate of deposit. The symbols of our era. Real progress, slow and deepseated change, would start by taking away the asphalt layer, going back to the soil and substituting, as symbolic elements of a new era, the insurance policy and the certificate of deposit with seeds and a source of public water. Thanks go to the translators, Gianmarco Lalli and Jamie Mackay. This article was published thanks to the author and Political Critique where it appeared on July 3, 2017. Also published in Seres Urbanos | El País and originally in Perspectivas anómalas.